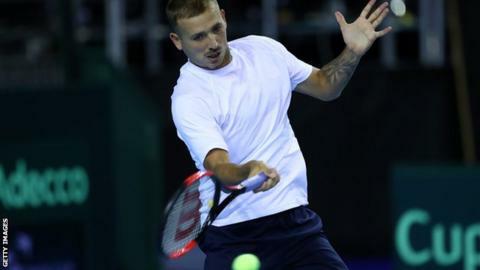 Dan Evans will play for Great Britain for the first time in over a year in Friday’s Davis Cup play-off against Uzbekistan. The 28-year-old will face world number 60 Denis Istomin in Glasgow. Evans made his comeback from a 12-month drug ban in April and has mainly played on the second-tier Challenger Tour this season. He failed a drug test after remnants of cocaine contaminated legal medication in his washbag. Although billed as a World Group play-off, Britain are already assured of a place in next year’s revamped Davis Cup, but they will only be seeded next year if they win this week’s tie in Scotland. “Did I think I’d be playing Davis Cup by the end of the year? No, not really,” Evans admitted. “I feel like I’m playing pretty good again, and hopefully I can just keep putting my game out on the court and improving,” he added. Britain’s highest-ranked player at the event will be Cameron Norrie, who will take on world number 434 Jurabek Karimov in what will be his second Davis Cup appearance. In the doubles, Britain’s Jamie Murray – fresh from his US Open mixed doubles title win – will team up with Dom Inglot to play Sanjar Fayziev and Istomin. He lost in the second round of Wimbledon qualifying after he was not granted a wildcard into the main draw but has climbed back to 222nd in the world after winning a Challenger event in Vancouver in August. Evans had reached a career-high world ranking of 41 just a month before he failed the drug test.